It’s straightforward (but must be done correctly, of course). It can be carried out anywhere if necessary. Searcher is able to use a range of senses: touch, sight, hearing and smell, to help him/her identify any suspicious circumstances. Interpretation is direct, without having to rely on an output from equipment. It can be unpleasant and unhygienic for the searcher. Hand searching is only effective if correctly done. Because it appears to be so straightforward, it is easy to do it inadequately. The process is very vulnerable to human failings such as bad habits, inconsistency, tiredness, etc. Electrical and electronic items (mobile phones, laptop computers, disk drives, cameras etc.) can be handled and visually examined (to assess weight, appearance, and to look for signs of tampering) but they cannot be effectively hand-searched, so they need to be screened individually by X-ray and trace detection. A bag search area must be equipped with suitable horizontal surfaces on which cabin baggage may be systematically searched. Such surfaces should be high enough to permit inspection without requiring the examiner to bend and sufficiently wide to provide some measure of separation of the baggage from the passenger. The passenger should be able to witness the examination, but should not be in a position to interfere with the search. The search area should ideally be designed so that cabin baggage searches can be conducted generally out of view of the general public or in such a way to avoid an analysis being made of searching standards and procedures(for security reasons). Wherever possible, hand searching should be conducted in the presence of the bag owner. When a bag is selected for search, the owner should be requested to open the bag. This will allow you to see if the person appears familiar with the bag and its contents. Perhaps the person may become nervous, uncooperative or hesitate, which may indicate that they did not pack the bag, or that they may know the bag contains something illegal or dangerous. It is important to adopt a systematic approach so that no parts of the bag or its contents are overlooked. The bag should be thoroughly examined to ensure that there is no false bottom, using a straight edge gauge-rule, rod or other device where necessary to establish whether there is a significant discrepancy between external and internal measurements. Particular attention should be paid to linings, trim, seams, rims, studs, zip fasteners, locks, hinges, wheels and handles to identify signs of tampering or repair which may indicate the concealment of a prohibited item and where suspicion is aroused, the area should be subjected to trace detection equipment if available. Contents should be removed layer by layer, each being examined until the bag is empty. The empty bag should be lifted by hand and assessed for balance and empty weight. If either give rise to suspicion that the bag is not of uniform weight, or of a weight consistent with being empty, the bag itself should be visually examined for concealment and then screened thoroughly by X-ray. Electrical and electronic items which might conceal a weapon or explosive, such as shavers, calculators, radios, clocks, cameras, personal stereos and their cassettes, etc, should be closely examined to ensure they have not been tampered with, are the expected weight, and are balanced and have no additional batteries. The owner can be asked to open folded items and also to switch-on items like laptop computers, etc. Individual items should be X-rayed, to ensure there are no unusual components, additional power sources, or organic material within what should be an inorganic shell. 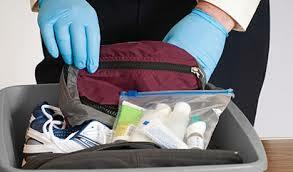 Items should also be subjected to explosive trace detection equipment, where available. Articles such as vacuum flasks, books, umbrellas, crutches, etc. must all be examined under X-ray to establish their bona fides. Attention should be given to the contents of all containers and bottles. They must be confiscated if they exceed the allowable liquid volume limit. Searchers should look for greasy stains and small holes in the exterior of any bag or case and for the smell of almonds, nail polish, solvents, polish, glue, perfume or other masking vapours which might indicate the presence of explosives. If you encounter soiled or possibly contaminated clothing, you should wash hands immediately and put on a pair of gloves before continuing the search. (Bear in mind that soiled items, such as baby’s nappies may have been used to try to deter the searcher from conducting a proper search). Bags should be closed and fastened on completion of the search. It is important to thank the bag owner for their co-operation. When an item has been hand searched it is important that the searcher informs the X-ray operator of what the object was that caused the rejection. The discovery of a weapon in a passenger’s cabin baggage may be dealt with by simply closing the bag and removing it from passenger’s reach. It is important to remain calm and not cause a panic amongst other passengers if a prohibited item is discovered during a search. Your supervisor should be summoned covertly who should in turn take action to summon assistance form the local policing authority support unit. A covert means to summon the authorities should be available at each screening point – usually a ‘duress’ alarm activated discreetly. Airport arrangements should ensure that a law enforcement agency is available to respond, and response times should be agreed. *The information about Hand Searching is provided here as a guidance only to compliment and not to replace procedures and guidelines used at your own locality/facility.